Because malnutrition screening remains unstandardized for hospital discharge, physicians must recognize malnutrition diagnostic criteria and make appropriate recommendations to ensure proper nutrition following inpatient stays. An 81-year-old Fayetteville, North Carolina, man who lives alone called 911 operators asking for food after being discharged home from the hospital and rehabilitation center for treatment of cancer. Weighing only 115 pounds and unable to "get out of his chair," he reported being hungry and had returned home to an empty refrigerator. He requested some food items to hold him over until his home care visits started.1 This story exemplifies the risk factors for malnutrition in older adults including the psychosocial, functional, and economic risk factors, as well as the traditional physiological risk factors related to acute and chronic diseases. More importantly, this real-life story underscores the importance of proper food and nutrition during care transitions. The aging American population will continue to exert an impact on the United States health care system. In 2010, 38.7% of hospital discharges and 44.8% of days of hospital care were attributed to older adults.2 As the number of older adults receiving acute care increases, so will their postdischarge needs. However, there are significant differences in posthospital health care utilization in the elderly. The oldest (aged 85 and older) are less likely to be discharged to home after a hospital stay and more likely to be discharged to long term care, compared with older adults in the 65 to 74 and 75 to 84 age groups.3 Older adults are at risk for malnutrition across the care continuum. What is more problematic is that while nutrition screening is often performed on admission to an acute care hospital or long term care facility, an older adult's nutrition status can worsen during an inpatient acute care or rehabilitation stay. Malnutrition screening is not routinely performed at discharge, so it becomes critical for geriatricians to pay careful attention to nutritional status during follow-up office visits. With aging, there are a number of factors that contribute to the risk of malnutrition. Chronic disease can be a major contributor. Many diseases, such as cardiac disease, renal impairment, and malignancy contribute to inflammation that can lead to significant loss of muscle mass.8 In addition, many diseases may prompt prescription of restrictive diets that may not always be necessary. Overly restrictive diets may be unpalatable or difficult to follow, leading to a decline in oral intake and, eventually, malnutrition.9 Functional status changes that limit the ability to perform activities of daily living such as cooking and shopping can impact an older adult's dietary intake. Significant psychosocial changes that may also occur with aging (eg, depression or simply eating alone), as with the loss of a spouse, can lead to a dramatic decrease in oral intake. Changes in finances can also impact the ability to purchase adequate food.10 Considerations for contributors to development of malnutrition are summarized in Table 1. For physician practices certified by The Joint Commission, it is recommended that, "Nutrition screening may be performed at the first visit for primary care, an ambulatory clinic, or office practice. Thereafter, the screens and assessment would be needed only as appropriate for the reason the patient is presenting for care or services. "11 However, this recommendation may not be sufficient for older adults. If an older adult has experienced an acute medical or surgical condition, a change in a chronic condition, or recent discharge from a hospital, rehabilitation, or long term care setting, it may be prudent to rescreen for nutritional problems. The diagnosis of malnutrition, risk for malnutrition, or the nutrition plan of care may not be included on the discharge summaries. Furthermore, older adults may become more vulnerable to malnutrition during recovery, especially if they have a weakened state, are unable to perform the routine activities of daily living, and live alone. At the present time, nutrition screening is always conducted upon admission to the hospital but not standardized upon discharge. Therefore it is prudent to implement nutrition screening as part of the routine geriatric assessment and to be on alert especially after an older patient has been discharged from a hospital or a skilled care or rehab facility. The best age-appropriate tool for nutrition screening in older adults is the Mini Nutritional Assessment (MNA) tool. It was developed specifically for the geriatric population and has two validated forms. The short form (MNA-SF) consists of only seven questions regarding changes in food intake, weight, mobility status, current disease or psychological stress, presence of neuropsychological problems, and body mass index. The full MNA consists of a total of 18 questions, which include all of the questions in the MNA-SF as well as additional data collection including anthropometric measurements.12 Both the MNA-SF and full MNA have been used in many studies internationally, and the forms are available in 30 languages and are free to download (www.mna-elderly.com). Many of the components of a nutrition screen and/or nutrition assessment can be easily gathered from an in-depth comprehensive geriatric assessment as noted in Table 2. It is difficult to consistently identify malnutrition in clinical research, as there has not been a single unifying definition of malnutrition. Definitions of malnutrition range from simple, such as degree of unintentional weight loss, to complex calculations that include anthropometric measurements and biochemical measures (generally serum albumin). In 2012, the Academy of Nutrition and Dietetics and the American Society for Parenteral and Enteral Nutrition (ASPEN) collaborated to develop clear characteristics to define three broad categories of malnutrition.13 These characteristics include the etiology of malnutrition, recognizing the influence of illness and inflammation on nutritional status. Starvation-related malnutrition describes pure starvation or anorexia nervosa; this type of malnutrition is caused by energy deficit, without any underlying inflammation. Chronic disease-related malnutrition is characterized by mild to moderate inflammation in the setting of chronic disease (defined as a disease or condition lasting three months or more), such as end-stage renal disease or rheumatoid arthritis. Acute disease or injury-related malnutrition is characterized by severe inflammation in the setting of acute illness, such as severe sepsis or trauma. These types of malnutrition have subcategories of moderate (or nonsevere) or severe malnutrition, depending on specific parameters described in Table 3. It is important to note that classifying a patient with a specific type of malnutrition requires only two criteria. Once a patient is identified as being at nutrition risk or suffering from malnutrition, interventions should be implemented in a timely fashion. These include referrals to dietitians and social workers (see Table 4). Dietitians can suggest appropriate meal choices and interventions, and social workers can help facilitate referrals for home-delivered meal services, supplemental nutrition assistance programs such as SNAP or food stamps, and in-home support to assist with cooking and shopping. Nutrition interventions may include lifting diet restrictions, encouraging frequent nutrient-dense meals with adequate calories and proteins, and use of oral nutrition supplements to increase calories and protein. The advantages of supplements are that they are easy to use and readily available. However, the downside is that some older adults may not like the taste, and even more so, might lack adequate resources to pay for supplements. Alternative menu planning such as specialized recipes for homemade nutritional drinks may be more acceptable and cost-effective. Nutrition counseling can also include ways to increase the nutrient density of meals and snacks in a palatable and cost-effective manner. Reimbursement for outpatient nutrition counseling will depend on the type of insurance. Medicare Part B will cover medical nutrition therapy for patients with diabetes or kidney disease, and for patients who have had a kidney transplant within the past 36 months.14 Other disease states may be covered if a patient has private insurance coverage in addition to Medicare. Nutrition plays a vital role in successful aging. While older adults are at risk for malnutrition due to physiological, psychosocial, and economic factors, transition from an inpatient stay to the home can intensify the risk. 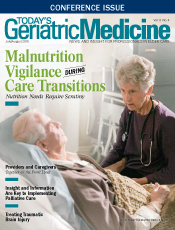 Geriatricians and primary care providers play an important role in the early recognition and treatment of nutrition disorders, including prescribing nutrition interventions and placing consults for dietitians and social workers to ensure older adults have access to nutritious food to enable recovery during care transitions. — Kris M. Mogensen, MS, RD, LDN, CNSC, is a team leader dietitian at Brigham and Women's Hospital and an instructor in nutrition at Boston University College of Health and Rehabilitation Sciences: Sargent College. Her clinical focus centers on enteral and parenteral nutrition and critical care while her research focuses on the impact of malnutrition on clinical outcomes. — Rose Ann DiMaria-Ghalili, PhD, RN, CNSC, FASPEN, is an associate professor in the doctoral nursing department and holds a secondary appointment in the nutrition sciences department at Drexel University in Philadelphia. Her research focuses on the impact of nutrition on recovery and health outcomes in older adults across the care continuum. 1. 'I can't get out of my chair,' elderly man with cancer calls 911 because he has no food. Fox 13 website. http://fox13now.com/2015/05/13/elderly-man-with-cancer-calls-911-because-he-has-no-food/. Updated May 14, 2015. Accessed June 3, 2015. 2. National hospital discharge survey. Centers for Disease Control and Prevention website. http://www.cdc.gov/nchs/nhds/nhds_tables.htm#number. Updated August 28, 2012. Accessed May 15, 2015. 3. Levant S, Chari K, DeFrances CJ. Hospitalizations for patients aged 85 and over in the United States, 2000-2010. Centers for Disease Control and Prevention website. http://www.cdc.gov/nchs/data/databriefs/db182.htm. Updated January 14, 2015. 4. Heersink JT, Brown CJ, DiMaria-Ghalili RA, Locher JL. Undernutrition in hospitalized older adults: patterns and correlates, outcomes, and opportunities for intervention with a focus on processes of care. J Nutr Elder. 2010;29(1):4-41. 5. Bell CL, Lee AS, Tamura BK. Malnutrition in the nursing home. Curr Opin Clin Nutr Metab Care. 2015;18(1):17-23. 6. DiMaria-Ghalili RA, Michael YL, Rosso AL. Malnutrition in a sample of community-dwelling older Pennsylvanians. J Aging Res Clin Pract. 2013;2(1):39-45. 7. Corkins MR, Guenter P, DiMaria-Ghalili RA, et al. Malnutrition diagnoses in hospitalized patients: United States, 2010. JPEN J Parenter Enteral Nutr. 2014;38(2):186-195. 8. Jensen GL. Inflammation as the key interface of the medical and nutrition universes: a provocative examination of the future of clinical nutrition and medicine. JPEN J Parenter Enteral Nutr. 2006;30(5):453-463. 9. Zeanandin G, Molato O, Le Duff F, Guérin O, Hébuterne X, Schneider SM. Impact of restrictive diets on the risk of undernutrition in a free-living elderly population. Clin Nutr. 2012;31(1):69-73. 10. DiMaria-Ghalili RA. Integrating nutrition in the Comprehensive Geriatric Assessment. Nutr Clin Pract. 2014;29(4):420-427. 11. Nutritional, functional, and pain assessments and screens. The Joint Commission website. http://www.jointcommission.org/mobile/standards_information/jcfaqdetails.aspx?StandardsFAQId=471 &StandardsFAQChapterId=1. Updated November 24, 2008. Accessed June 4, 2015. 12. Anthony PS. Nutrition screening tools for hospitalized patients. Nutr Clin Pract. 2008;23(4):373-382. 13. White JV, Guenter P, Jensen G, et al. Consensus statement: Academy of Nutrition and Dietetics and American Society for Parenteral and Enteral Nutrition: characteristics recommended for the identification and documentation of adult malnutrition (undernutrition). JPEN J Parenter Enteral Nutr. 2012;36(3):275-283. 14. Nutrition therapy services (medical). Medicare website. http://www.medicare.gov/coverage/nutrition-therapy-services.html. Accessed May 31, 2015. 15. Sampson EL, Candy B, Jones L. Enteral tube feeding for older people with advanced dementia. Cochrane Database Syst Rev. 2009;(2):CD007209. 16. Hanson LC. Tube feeding versus assisted oral feeding for persons with dementia: using evidence to support decision-making. Ann Longterm Care. 2013;21(1):36-39. 17. Givens JL, Selby K, Goldfield KS, Mitchell SL. Hospital transfers of nursing home residents with advanced dementia. J Am Geriatr Soc. 2012;60(5):905-909. 18. Schwartz DB, Barrocas A, Wesley JR, et al. Gastrostomy tube placement in patients with advanced dementia or near end of life. Nutr Clin Pract. 2014;29(6):829-840. 19. Institute of Medicine. Nutrition and healthy aging in the community — workshop summary. http://www.iom.edu/reports/2012/nutrition-and-healthy-aging-in-the-community.aspx. Published March 20, 2012. 20. Sahyoun NR, Vaudin A. Home-delivered meals and nutrition status among older adults. Nutr Clin Pract. 2014;29(4):459-465. 21. Sahyoun NR, Vaudin A. Nutrition in the transition of care from hospital to home. Clin Nutr Insight. 2013;39(10):1-4. 22. Humana Well Dine. Humana website. https://www.humana.com/provider/support/clinical/health/meals. Accessed June 3, 2015. 23. Elders Living at Home Program. Boston Medical Center website. http://bmc.org/eldersathome/nutrition.htm. Accessed June 4, 2015.
are-discharged. Updated April 2, 2015. Accessed June 3, 2015.